From AQUATHERICS® certification program to Watsu® to Coaching to Hypnotherapy to Private Sessions, Theri has 35 years experience to give you expert awareness and professionalism. Her mission is for you to reach your highest goals regarding your personal health and well-being. If you choose to continue on to a water career, Theri is the top mentor in the world and she is based right here in San Diego. 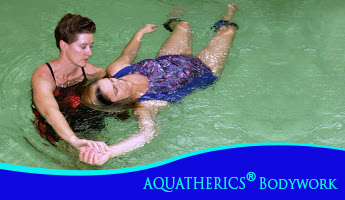 She is internationally acclaimed for her Aquatic Bodywork Classes and for mentoring new instructors. Theri maintains a large medically based private practice in San Diego continually expanding her experience to share. Theri is Proudly Instructing Classes Worldwide & Maintaining Her Private Practice and Classes In San Diego. Aquatic Bodywork in San Diego, California, provides you with a variety of aquatic bodywork techniques and certification programs. The owner's focus is on the safety of both the client and practitioner through awareness of structural alignment and integration. She teaches and accesses safe energetic boundaries and connections while following the inherent wisdom of the body. Theri absolutely loves that there is no other modality that addresses pain and stress management with the consistent results that zero gravity allows. With 35 years of experience and successful results, you can trust the services that she provides to you. Contact Theri in San Diego, California, to request more information about the Aquatic Bodywork programs available. Only International Trainer Certified and Licensed to Certify Health Professionals in Three Styles of Aquatic Bodywork as Practitioner and on to Instructors.